Pipelines are the safest method to transport petroleum products – and they’re getting safer all the time. Improvements in technology, higher standards for site selection, installing and monitoring, and faster responses to potential problems have contributed to a rapid decline in environmental impacts. Pipelines operate all day, every day with the help of powerful pumps, additives that move the oil with less resistance, and the laws of physics. 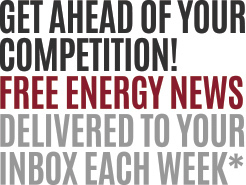 Each pipeline’s operations are monitored 24 hours a day, seven days a week, 365 days a year. Trained professionals follow legal standards and practices to ensure tasks like welding operations, valve inspections, pipeline repairs, corrosion prevention system checks and other maintenance are done accurately and according to procedure. 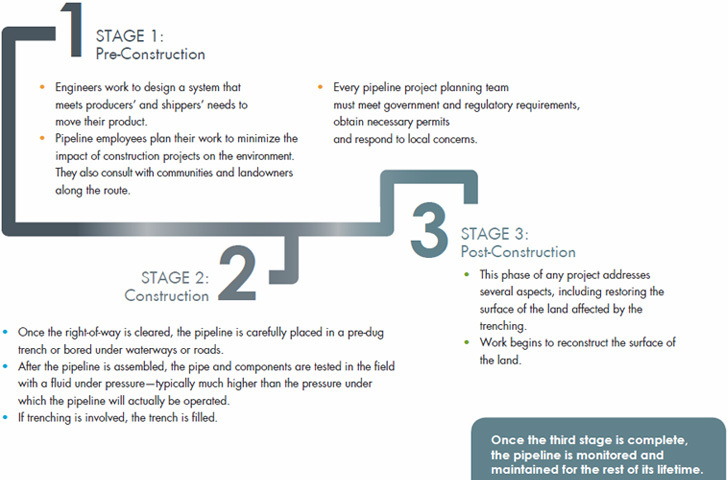 Like any project, the design and construction of a pipeline can be broken up into three stages: pre-construction, construction and post-construction. Each stage is overseen by qualified inspectors to ensure compliance with the engineering plan, codes, permit conditions, landowner and easement agreements, and regulatory requirements. Dilbit, or diluted bitumen, is a substance that is constantly being studied. No scientific basis has been found to claims that dilbit causes greater internal corrosion in oil pipelines than other crude oil sources. Scientists with the government-owned research group Alberta Innovates and a private firm, Crude Quality Inc., analyzed and documented properties of dilbit over many years. Neither group found that any unique characteristics of dilbit could increase the risk factors for pipeline failure due to internal corrosion. 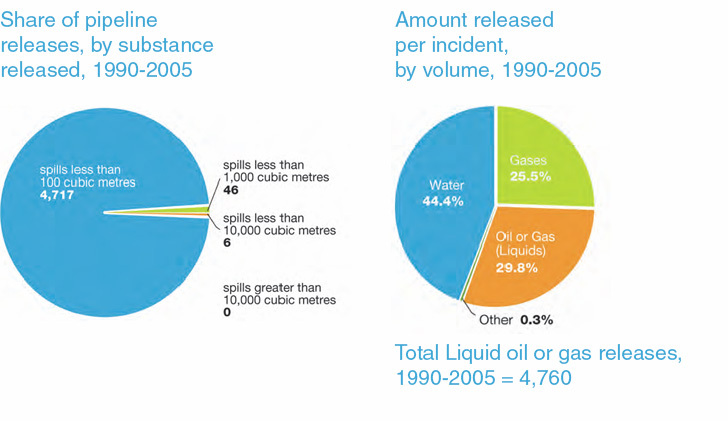 From 1990 to 2005 in Alberta, most pipeline incidents resulting from internal corrosion were on water-bearing, natural gas and sour gas lines, not crude oil pipelines. QUESTION: Is there sand in dilbit that scours the pipes? All oil products moving through pipelines must meet specifications which set a maximum on how much sediment and water they can contain. No product derived from bitumen, including dilbit, can exceed the tariff limit. Pipelines are monitored around the clock using the latest technologies. At numerous points along the system, operators monitor the volume, pressure and movement of liquid or gases in a pipeline. When changes or variations from what is expected are observed, they are evaluated and analyzed for the possibility of a problem that would indicate a potential leak or rupture. Additional on-site inspection and investigation can be triggered if necessary. While every pipeline company is working to achieve incident-free operations, accidents do happen. 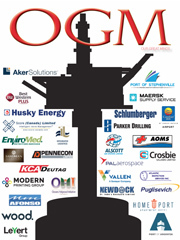 In those instances, operators can shut down pipeline systems quickly and safely. The key IMO is to keep reviewing on a regular basis the safety monitoring and management protocols in order to detect and prevent spills.